There's an anomaly in this graph from my prototype economic model of long-term storage. 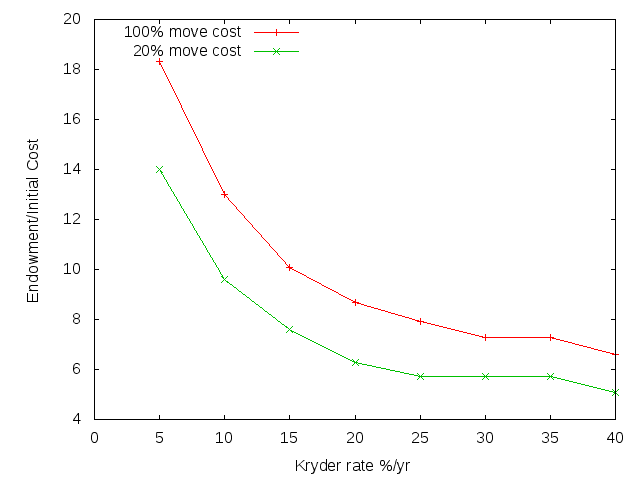 It shows the endowment as a multiple of the initial storage purchase cost that would have a 98% probability of not running out of money in 100 years, plotted against the Kryder rate, the annual percentage drop in storage purchase cost. 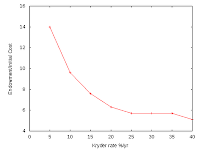 The region between Kryder rates of 25% and 35% is flat. It seems strange that, with storage prices dropping faster, the endowment needed isn't dropping too. I finally got time to figure out what is going on, and I now believe this is an artefact of the technology replacement policy model I implemented as part of the prototype model. It isn't that the policy model is unrealistic, although there is plenty of room for disagreement about alternative policies. Rather, the parameters I gave the policy model to generate this graph were unrealistic. Follow me below the fold for what Paul Krugman would call a wonkish explanation. Paying the move-out cost of the current technology. Paying the move-in cost of the alternative technology. 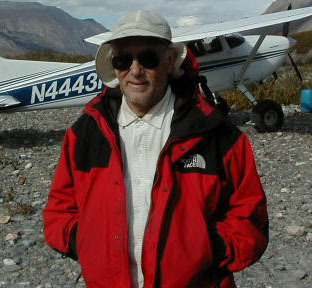 Paying the running costs of the alternative technology through the remaining life of the current technology. 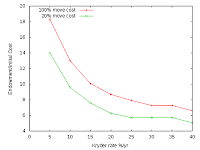 It then compares these net present costs and chooses the lowest. When I generated the anomalous graph, I set the move-in and move-out costs of each technology to 20% of its purchase cost. To the left of the flat region of the graph prices are dropping so slowly that the model keeps each technology for its 5-year life. None of the new technologies showing up during that time are good enough to motivate a move. To the right of the flat region prices are dropping so fast that the model moves technologies every year. In the flat region the model keeps each new technology for between 1 and 5 years, attempting to minimise the cost. It ends up having to choose between technologies that offer minimal benefits after paying the move-out and move-in costs. Move-in and move-out costs at 20% of the purchase cost each are probably unrealistically low. Setting these parameters to 66% results in the upper curve of this graph. The flat region is smaller, and the whole graph is higher reflecting higher costs. To the left, the model is keeping technologies for their 5-year life. To the right it is changing every 2 years. 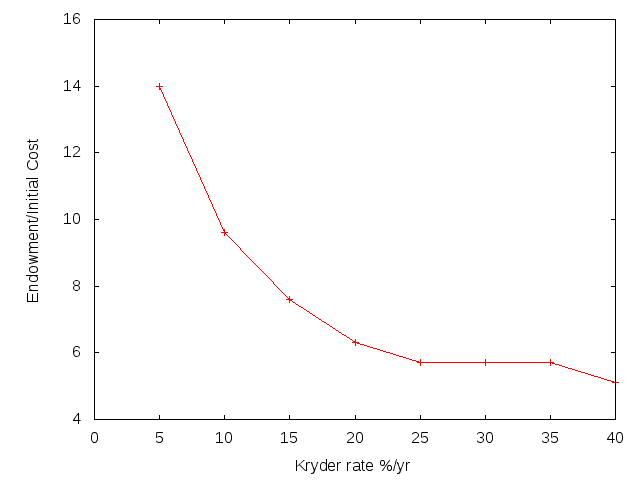 Between Kryder rates of 30% and 35% the model is struggling to decide how long to keep each technology. Overall, the higher costs of moving are forcing the model to keep each technology it buys for longer. Again, the model seems to be generating plausible results even if at first sight they look odd.